Travelers who are stressed out, overweight, or looking for a natural way to cope with many chronic illnesses should check into the Devaaya Ayurveda and Nature Centre. Located on Divar Island in Goa, India, Devaaya (which means Divine Healing) brings the art and science of traditional Ayurvedic medicine to guests from around the world. Similar in ways to traditional Chinese medicine and homeopathy, Ayurveda is a practice that dates back several thousand years to the Sanskrit culture. Its goal is to balance the body’s biochemistry and, using a holistic approach, treat the body, mind and spirit together to achieve complete wellness. 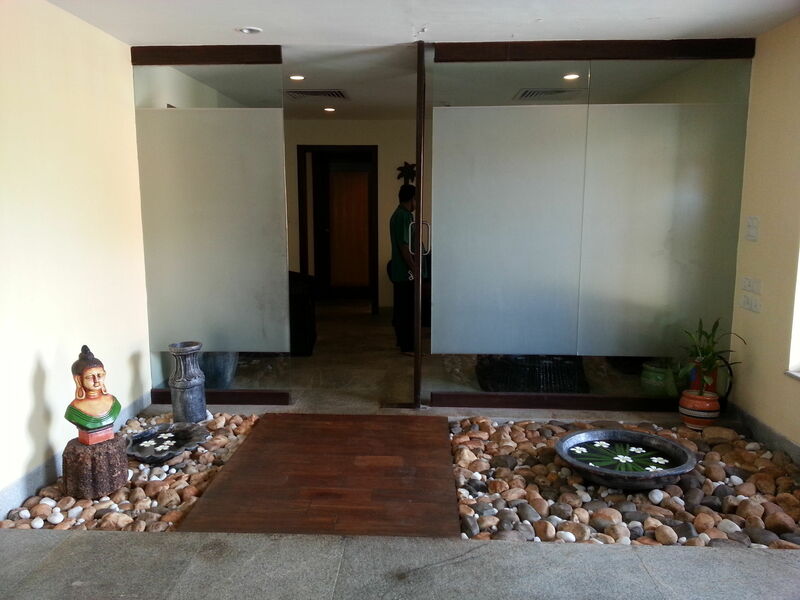 What makes Devaaya different from the many local Ayurveda clinics is its gracious blend of East and West. The tranquil, five-acre landscaped property is just across the Mandovi River from Old Goa, the state’s historic Portuguese Quarter. Palm trees and a quiet backwater surround the lawn where yoga is practiced each morning. 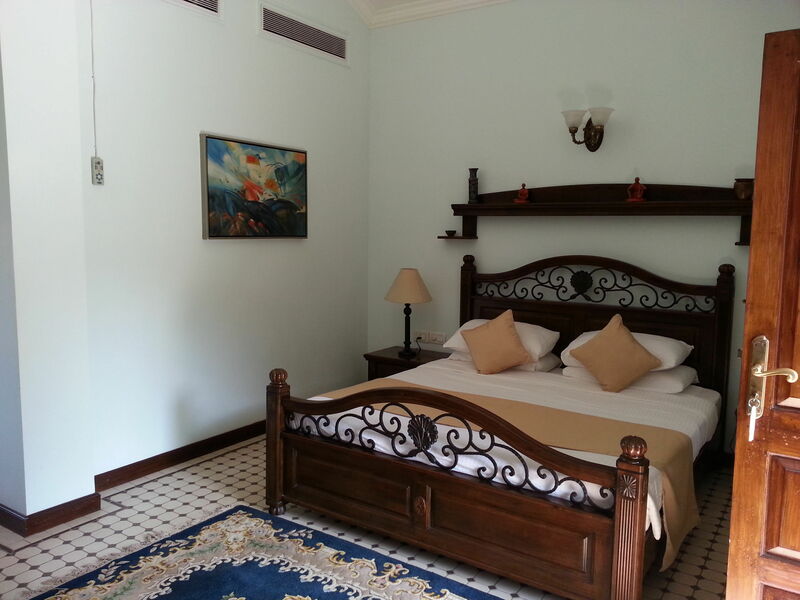 There are 60 large and simple guestrooms tucked into brightly colored stucco buildings; a few are freestanding villas. Carved wood furnishings in the Portuguese style, crisp linens, colorful fabrics and patterned tiles comprise the décor; each room has a ceiling fan, modern bathroom and an outdoor seating area. Here’s a video overview from my visit. I interviewed Dr. Shiny Benedict, one of four staff doctors, who explained that the first two years of her 5.5-year medical college were devoted to the study of allopathy or Western medicine, followed by intensive courses in Ayurveda. The resort doctors review guests’ medical records and prescriptions; some will even continue conventional treatment while there. In fact, the Apollo Victor Hospital in nearby Margao is a sister property to the resort and to the Goa Ayurveda Hospital, so there are facilities to treat patients in a variety of ways. Prior to booking, all guests are in touch with Devaaya’s doctors by email to review their course of treatment and determine if they should stay 7 days (the minimum), 14 or 21 days. Devaaya days begin with yoga by the waterfront and breakfast at the open-air pavilion, followed by prescribed therapies; customized massages; exercise at the pool, tennis or basketball court if allowed; and spa time. Diet is an important part of the treatment. No smoking, drinking, or caffeine is allowed and all meals are strictly vegetarian. Devaaya follows the principles of Naturopathy in using herbs, spices, fruits, and vegetables to detoxify the body; simply put, each menu is personally prescribed for each guest. In addition to overall wellness, Ayurvedic medicine is used to treat chronic illnesses such as diabetes, arthritis, high blood pressure, ulcers, weight loss and stress. Naturopathy is used to strengthen the immune system, thus curing or controlling obesity, migraine, gout, sinusitis and a variety of other disorders. According to their staff, Devaaya sees many clients return every year or two for continuing treatments that allow them to live full lives despite their illness. Anyone interested in trying a natural remedy without side effects should study the Devaaya website and consult with the staff before booking a wellness vacation. Goa is easily accessed by Air India flights from Delhi, Mumbai and other cities, as well as by highspeed trains. Winter (October to March) is the busy season for foreigners who like the cooler weather. The Monsoon (June to September) averages about 25 C with some rain each day, and is preferred by Indians who believe that Ayurveda techniques work better in more temperate weather. Devaaaya is not only for the ill. Dr. Benedict said that 90% of the guests are wellness clients, with the rest being companions and children ages 14 and up who can spend their days sightseeing or enjoying the beaches of Goa (Goa Tourism has sightseeing info). It’s popular with Europeans as an intense, week-long ‘me time’ experience of personal detoxification and wellness. The resort also gets groups led by their own yogi who come for a yoga retreat. Patients are welcome to bring family and guests; rates vary according to your needs. Depending on season, they range from 58,800 INR (about US$972) for a seven nights’ stay in a single superior room including ayurvedic treatments, to 92,400 INR (US$1526) for two people sharing a room, with both enjoying therapy. See Devaaya for more information. After just a few hours on property I left feeling refreshed and hopeful, confident that Devaaya could help many people. 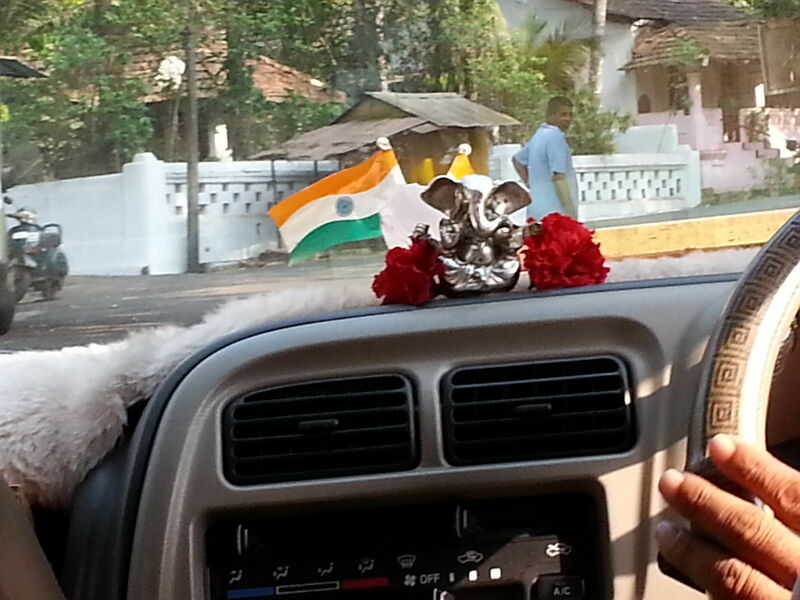 My taxi driver Pradeep, told me on the way back to the ferry that he had many guests from Germany, Italy and the UK who return year after year to refresh that feeling. 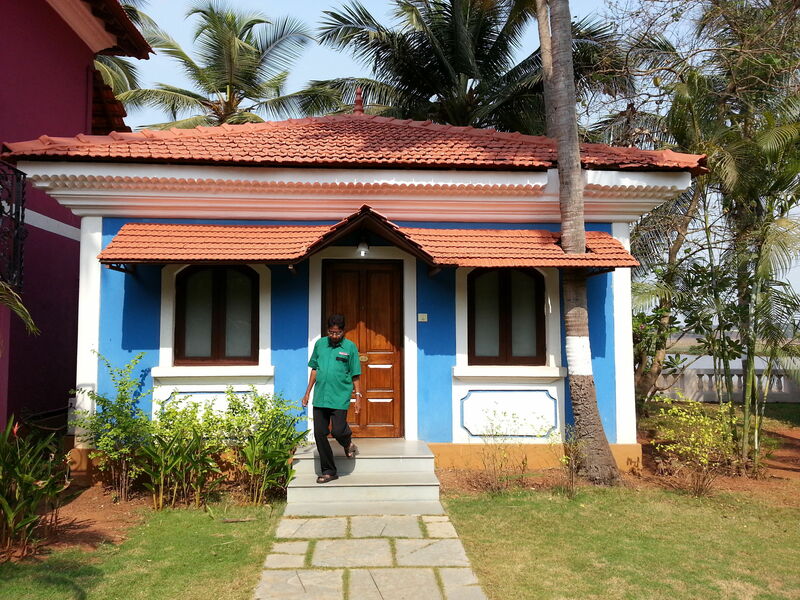 As a lifelong resident of Divar Island, he too was confident in this resort’s ability to heal.